Workforce mobility fosters an unending number of challenges for IT: data spread across devices and multiple cloud services, unpredictable schedules, and varied network connections can all complicate your department’s efforts to protect and govern data. In order to unify the backup and protection of these disparate endpoints under a single roof, read on here. 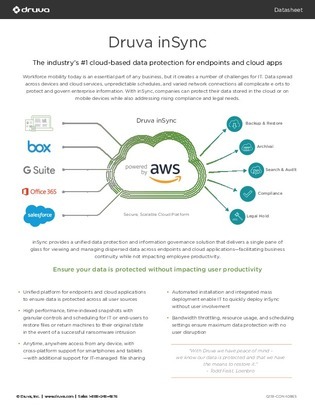 You’ll gain access to the features of a data protection and information governance solution for managing dispersed data and cloud applications: Druva inSync. Inside Druva also compares its endpoint protection to Carbonite Mozy.